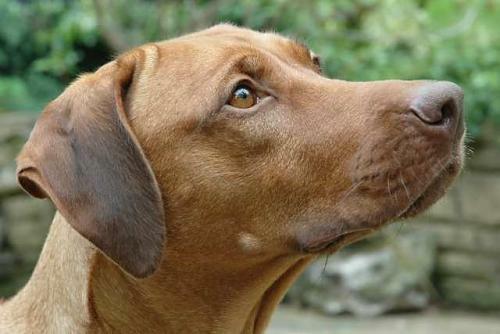 Phoenix was bred by and came to us courtesy of our good friend Sue Campbell of Nyassa Rhodesian Ridgebacks. She has been a welcome addition to our household since October 2005, originally living with us "on loan" with a view to mating her to Maestro. Well they did mate and produced some lovely puppies (litter page here) Buy the time that the puppies had gone to their new homes she had really got her feet under the table, so with agreement from Sue she stayed! We have to say she has been a pleasure to have around and has mixed with the rest of the pack as if she has known them all her life. A beautiful girl of sound construction and beautiful expression, she is a real character, as liver noses often are!! Our deepest thanks to you Sue, for allowing her to come to live with us. We are forever in your debt.......we think........well, she is a liver and they are all mad!!! Then of course we had to keep one of the puppies and that's where Lilly came from.